The kids and I just returned from a little mini vacation at the Jersey Shore with my sister and her family. 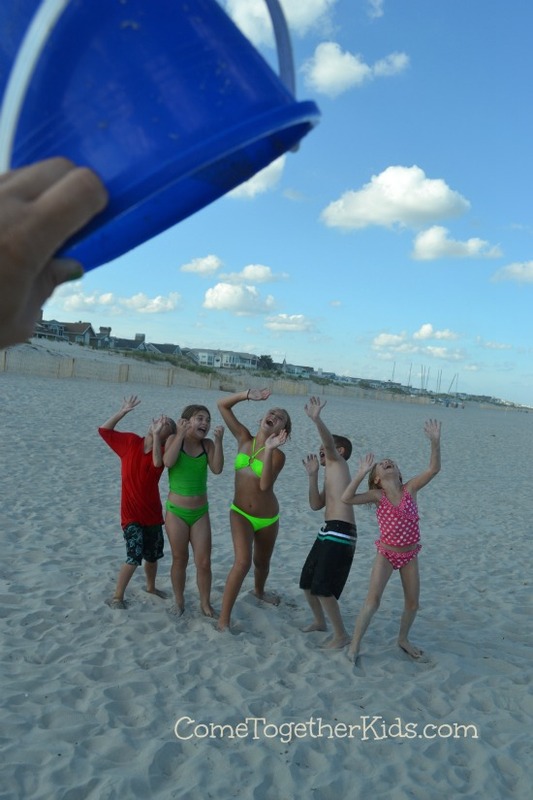 The kids had a blast with their cousins and I was excited to snap this funny photo "capturing" the cousins under a huge sand bucket. I originally saw the idea on Pinterest from THIS Flickr photo. My photography skills aren't as good as the original, but it was a simple shot to capture. I just asked the kids to go a little ways down the beach, then held the beach bucket in my left hand and the camera in my right. I told the kids to pretend something was attacking them from above (which they gladly acted out). Because I just used the auto focus on my camera, I had to lock the focus on the kids, then move the bucket into the shot (otherwise the kids would have been too blurry and the bucket would be in sharp focus). I got a few funny looks from other beachgoers, but it was worth it for this cute photo. 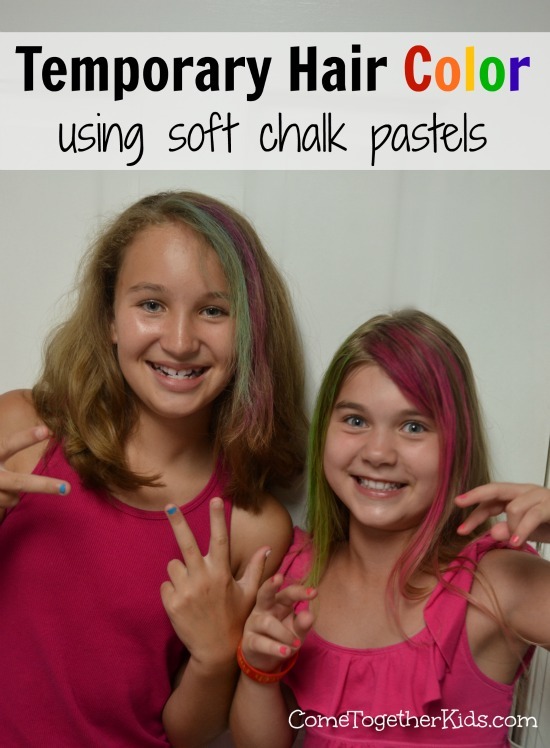 I'd seen this idea for using chalk pastels to color hair several times over the past year or so, but I finally had the perfect opportunity to test it out when the kids were visiting their cousins last week. I searched again on Pinterest, found this tutorial at Little Pink Monster and ran out to the craft store to pick up some soft chalk pastels. 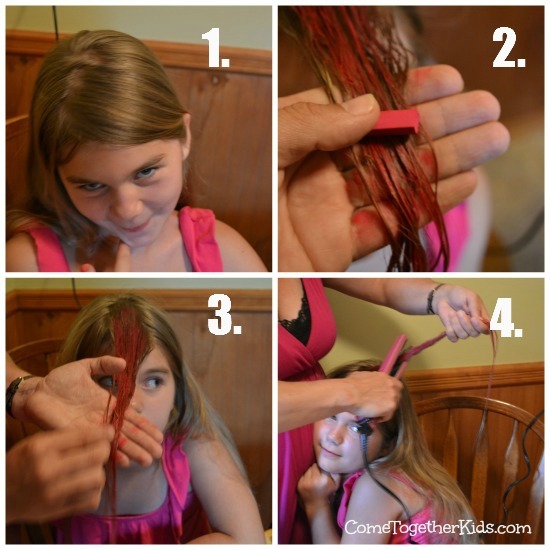 The girls loved it and it was really easy and inexpensive. 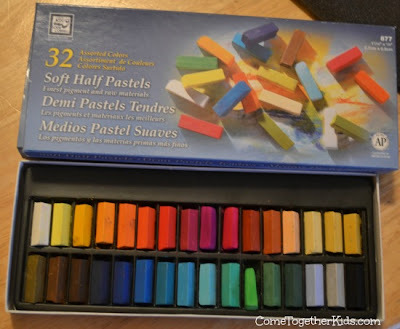 First, I picked up this set of soft chalk pastels (Amazon affiliate link) at the craft store, using a 40% off coupon it was less than $5! Next we got to work putting colorful streaks in the girls' hair. 1. 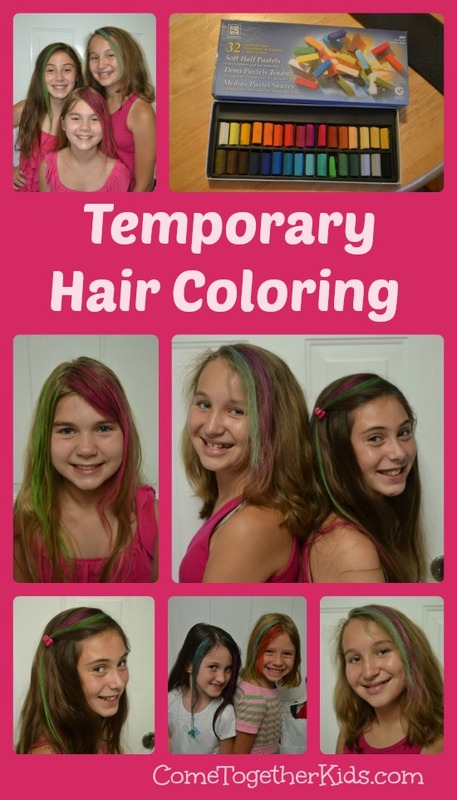 We brushed their hair to get rid of any tangles and the girls chose a color. 2. I took a section of hair where we wanted color and dampened it with a wet paper towel, then rubbed the pastel over the section. A spray bottle of water would also work well. 3. I rubbed the pastel over the section a few more times, trying to get the color somewhat even from root to tip. 4. Finally, we used a flat iron (could also use a curling iron) to "dry" the hair and heat set the color. 2. We used a flat iron, but you could also use a curling iron or possibly even a hair dryer. It really helped to heat set the color so it wasn't dripping down on their faces or clothes. 3. Even with the heat setting, some colors did leave a little residue on fingers and foreheads (especially the pinks and reds). It didn't bother the girls at all, but it's worth noting. 4. The chalked colors did wash out of the hair with regular shampoo. It came out easily from the darker-haired cousins, but took one shampoo and then a swim in the pool before it came out of my oldest daughter's hair. Her hair is lighter, pretty fine and I used quite a bit of the pink pastel in it. It didn't bother her (or me) since it was summer and we had no plans that required color free hair, however, you might want to test the colors you want on a small section if you're worried about wash-ability. Yikes, can you believe it's been over 3 months since I last posted?! 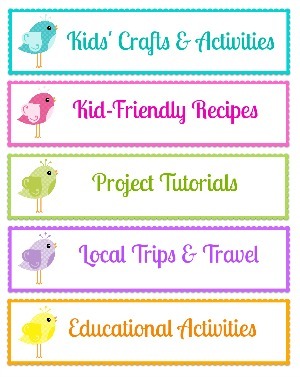 Life always gets busy once Spring rolls around, but this year seemed even busier than usual. 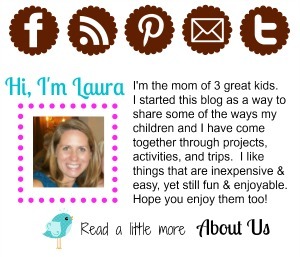 Yup, no real excuses, I was just a mom, alternating between being super busy and totally wiped out. In any case, though, I'm back. 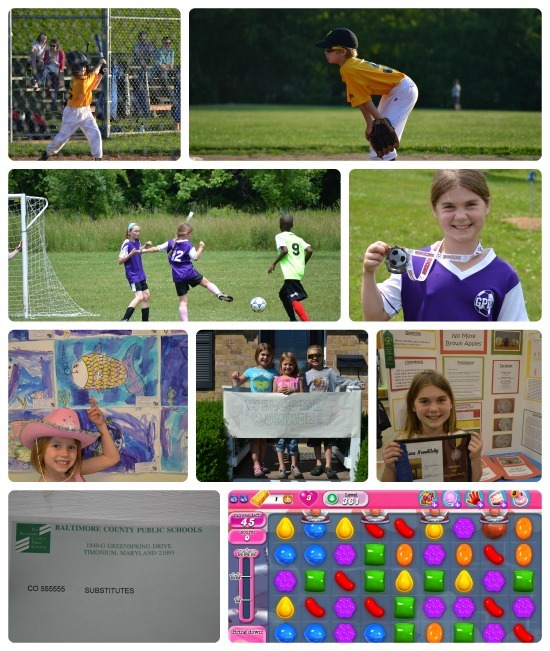 I have several cool posts about things we did over the past few months that I didn't blog about and we've done a few fun things since school let out. As I catch up with new posts, I'll also be sharing some really fun older posts on our Facebook page that I think you'll enjoy. Oh, and make me feel better, has your Spring/Summer been crazy like mine? Were you able to manage everything or did you let stuff slide too so you could just chill out some nights?